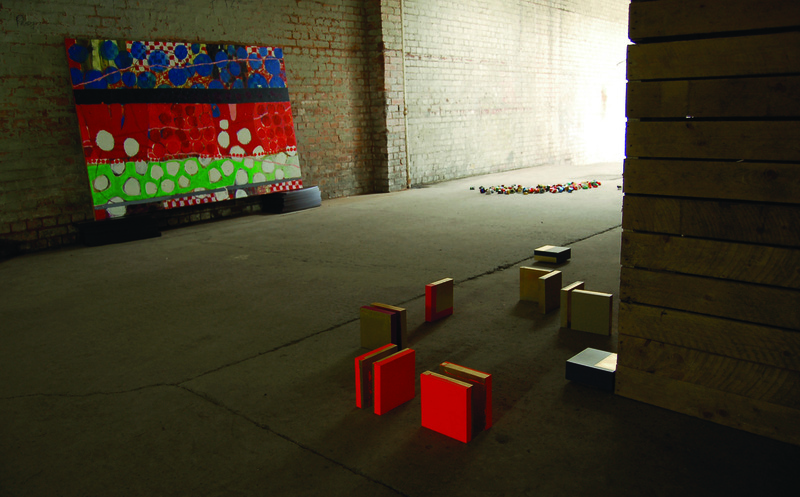 (artworks from left to right) Gabo, I need a study with a lot of balls, 2008, paint on photograph; Cathy Wade, Memoirs of an Architect’s Son, 2008, wood, paint, gold leaf. GOODS In, 2008, Smart factory. Photo: Charlie Levine. Jack Welsh, Man’s Best Friend, 2008, matching bedroom furniture, wood, nails, gloss paint, glue, battery light. GOODS In, 2008, Smart factory. Photo: Charlie Levine. Birmingham—once referred to as the Industrial Heartland of Britain—is undergoing a major cultural renovation. The abundance of disused factories throughout the city, a tribute to its history, are being transformed into Artist-Run Initiatives (ARIs), effectively attempting to shed the cloak of industrialisation and bring Birmingham into a more artistically aware future. While it could be said that Birmingham boasts an underground but established art scene, the general population appear almost fearful of the arts and there is a real sense in Birmingham of apprehension and a reluctance to embrace it which isn’t as apparent in such places as London, or even Sydney. Perhaps that’s why I ended up here. However, my timing couldn’t have been more unfortunate. As a Sydney-born, UK-based freelance art writer, the recent economic downturn has made my future all the more uncertain. Art, its every variable facet, is such a temperamental and turbulent beast under the best of circumstances. And so I have joined with Birmingham based freelance curator Charlie Levine and artists Harminder Singh Judge and David Miller, to defy the recession and take the future into our own hands by establishing a new artist-run initiative: Conveyor. Having presented an exhibition in 2008 titled GOODS In within a section of an old furniture-making factory outside the city centre, co-founders Levine and Singh Judge concluded that it would be the perfect home for a new collective. And thus, Conveyor joined the ongoing tradition of ARIs in Birmingham. Unlike Sydney, where unused spaces are limited and often expensive, Birmingham is ripe with empty factories and warehouses as a result of its industrial past. While many of these spaces are monopolised by the rental market, numerous such buildings have been left abandoned. In many cases it is simply a matter of knowing the right arm to twist and the right concept to pitch to acquire space for ‘one-off’ exhibitions. Preparing for its first show, Conveyor is primarily about process and collaboration between artists, curators, writers and arts organisations and the development and continual realisation of one-day art events and exhibitions. It is this focus on the one-day event structure of the space that sets it apart from other ARIs in Birmingham. With an exhibition program that is set to include Sydney-based video artists Sam Smith and Kate Mitchell, along with a number of exciting artists from across the UK, Conveyor is undoubtedly bringing something fresh and innovative to the constantly evolving and slowly emerging art industry in Birmingham. While Levine, Singh Judge, Miller and I each joined this initiative with separate agendas, we are all united by one common goal—to promote exceptional national and international art and attempt to transform Birmingham into a more culturally aware city for the future. Sitting down with Levine we discussed the recent economic downturn, Conveyor and why she’s determined to make her future—and the future of the city she calls home—a little more certain. Naomi Gall: Firstly can you give a brief background to how you became involved in the arts? 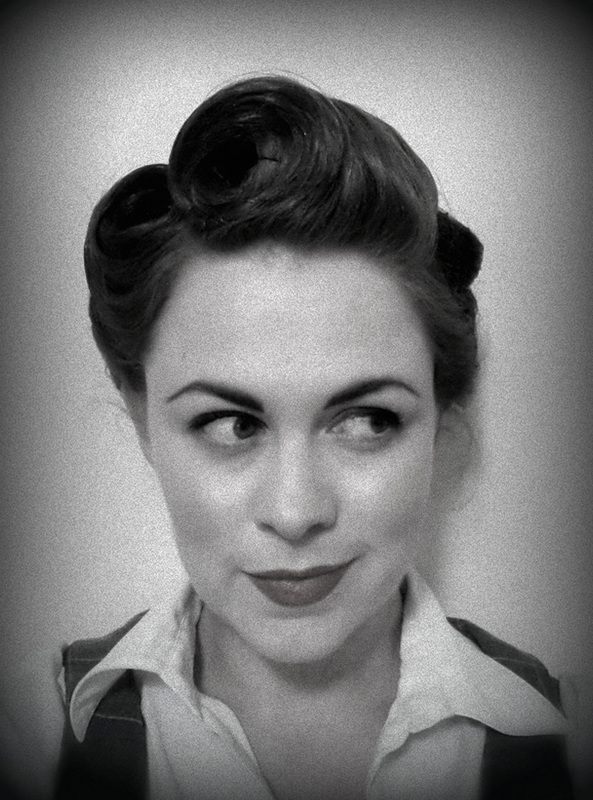 Charlie Levine: I began my career in art through my study of photography at the Surrey Institute of Art and Design (SIAD). It was this experience and the influence of my lecturer David Campany that really led me to engage critically with not only photographs, but also art in general. I became very preoccupied in my final year with the display of work and how one encounters art, and from this interest and my research it made sense to move into curating and critical writing. NG: Do you think there is a trend emerging where curators are turning their backs on the established galleries and going freelance? CL: Birmingham is a really interesting city when it comes to artists-led, curatorial-led, freelance-style practices. Don’t get me wrong, there are some amazing institutions that give funding and there are some fantastic artist-run practices that receive funding so it’s not all negative. There has always been a real culture of artist-run initiatives in Birmingham and there has always been a want, a desire and a need for it. As a result of its solid history I think artist-led spaces are really welcomed by the arts audience. The main problem is sustainability and within the current climate this has become an even greater issue. NG: Tell me about the new collective, Conveyor. CL: I would like to think that Conveyor is emerging out of the long history of artist-run spaces in Birmingham and will become a part of that history. 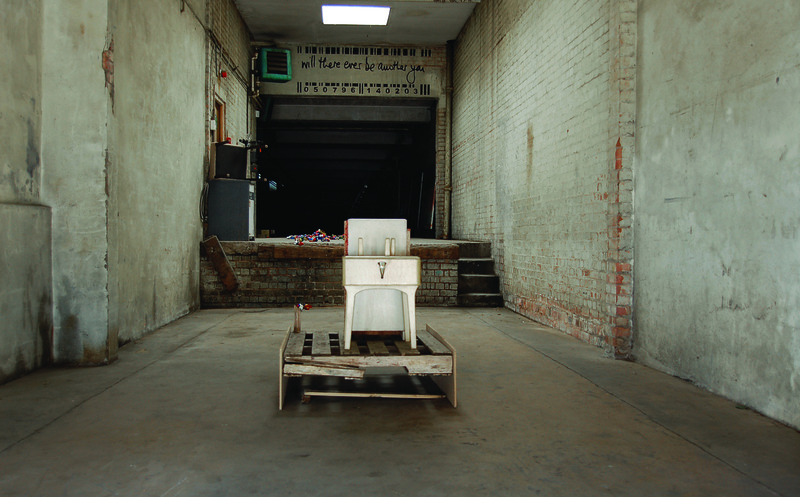 In 2008 I curated a show with artist Harminder Singh Judge, who is also the Co-founder of Conveyor, called GOODS In. It was in an old furniture-making factory in Moseley, just outside Birmingham’s city centre, called G. S. Smart and Co. Factory. It was a one-day event incorporating work from fifteen international and UK-based artists responding to the space. This was my introduction to the space. Conveyor will inhabit about one eighth of the entire space—it’s a huge building—and it will be sectioned off from the rest of the factory. It’s totally dishevelled, no one’s been in the space for years and while the furniture is obviously no longer being produced, it still lives in the space and will be used by the first two site-specific artists who are scheduled to exhibit. Basically we are trying to set up and realise a new artist-run space that shows national and international artists. To an extent we want to continue the tradition of promoting Birmingham artists while reaching beyond the city. Birmingham is still growing—artistically speaking—and if Conveyor can assist in opening people’s eyes to what’s out there then we will have achieved something. NG: What is the plan for the first show? CL: The first show will be a site-specific response to the space. We’ve invited a duo from Halifax in the UK, called Milk, Two Sugars, to utilise whatever materials they are able to find within the space to make sculptural pieces that, in a sense, archive and critically comment on the history of the building. Milk, Two Sugars will bring a sense of comedy and unpredictability to the space as they are known for their illustrative work, which always contains a satirical edge. There will also be a take-away aspect to the show, which will remain secret until the exhibition day. NG: How is Conveyor different to other artist-run initiatives in Birmingham? CL: For starters, we are completely untouched by any type of formal ties or bonds. We are not affiliated with anybody, we receive no funding and therefore we have no agendas to adhere to except our own, and the artists we choose to exhibit. Also, by promoting ourselves as an ‘events’ space there is more freedom to have a higher rotation of artists and we are capitalising on the buzz and excitement that generally accompanies the openings of exhibitions. If we can sustain a sense of intrigue around the space then it opens Conveyor up to innovative collaborative projects where there are basically no boundaries or limitations to the creative process. In this sense Conveyor is functioning on an entirely different level to other artist-run initiatives in Birmingham. 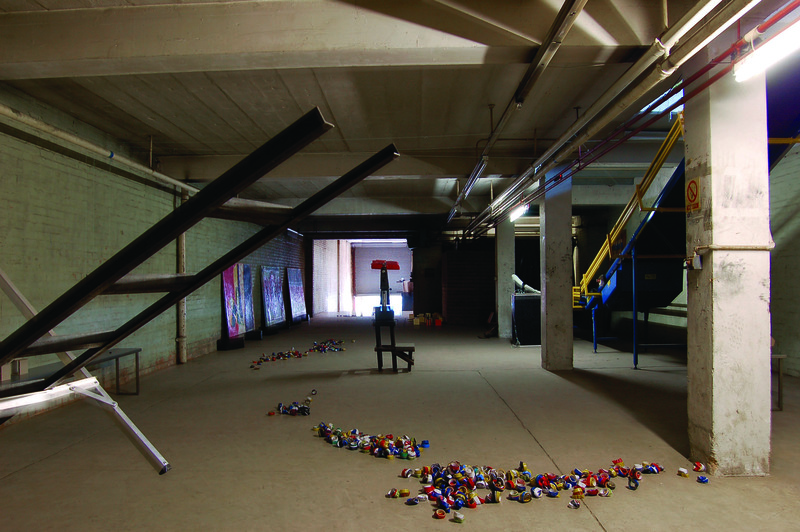 NG: How is a gallery like Conveyor an asset to the Birmingham art scene? CL: It’s a tremendously valuable asset, absolutely. Birmingham’s history has always relied on the artist-run space so there’s no reason to stop now when there’s a proven formula that it works: it’s just a matter of keeping it sustainable. The thing with Birmingham is that you don’t want people to come to the city just to go shopping in the Bull Ring or to have a coffee at one of the four Starbucks. If that’s all they come here for, they will leave poor and over-caffeinated! When you offer people in Birmingham something they do respond to it and want it but, like I said, it’s just a question of sustainability. There is an audience out there for this type of initiative; we just have to find it. NG: Do you think Conveyor has a long term future, given that at present it is entirely self-funded? CL: Given that we are entirely self-funded it is difficult to think beyond one year at a time. We have an amazing line up of artists scheduled for this year, and if Conveyor is well received by the people of Birmingham I don’t see why it wouldn’t continue for a second year. The trap for us would be to think too far in advance. While we are presently entirely unaffiliated, we would not be completely opposed to joining forces with other arts organisations in the future or attempting to acquire funding—but only so long as the integrity of the space was maintained—otherwise what’s the point? Conveyor held its opening exhibition on 6 June 2009 with UK artists Milk, Two Sugars. Originally published in Runway, Issue 14, Futures, Winter 2009, pp 22 -25.